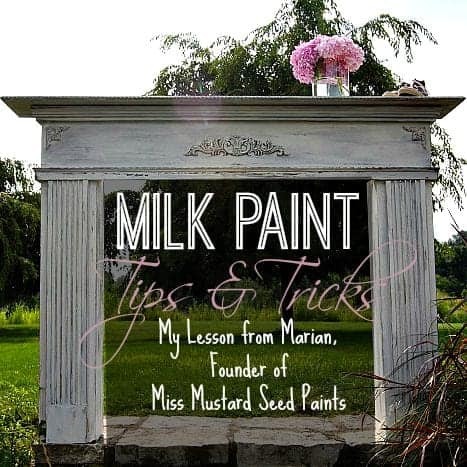 Last year, I had the honor of attending a hands-on workshop with Marian, the owner of Miss Mustard Seed. I took diligent notes as Marian spoke. Until this class, I personally struggled with using her paints and I wanted to know more. So here are some of the tips she shared with a room full of eager students, like myself. It was so awesome to see everyone’s projects and different outcomes, but I was honestly starstruck and just honored to be there. 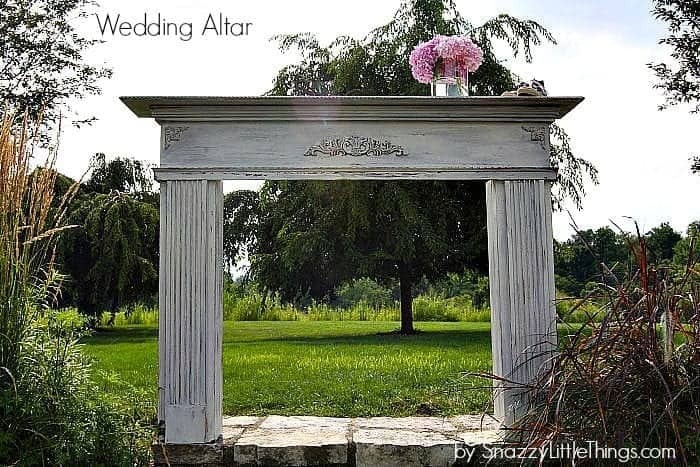 Everything I learned from her class helped me achieve the final finish of our wedding “altar” below, which was a vintage-looking mantel that we built new, painted, distressed and chipped it to make it look like an original architectural salvage item. MMS works great on raw wood. This will absorb into the raw wood like a stain. Made with unique, natural ingredients. Achieves the shabby chic look without a lot of distressing, but works especially well on a pre-painted surface. To achieve the chippy look there are a few techniques which I will explain below. * Must be willing to go with whatever the outcome might be. This is NOT the paint to use if you want to control the outcomes. * Would be hard to strip this paint, but you can certainly paint over it later. * Ratio –add water until paint flows well. If it’s lumpy — then it’s too thick. Watery is good! * Curio – this is a a dark brown paint MMS color that can act as a stain on plain wood. * Ok to use a sprayer but strain it first, milk paint tends to be grainy. Grainy is normal and is easily sanded off. Can use any top coat that you love over Milk Paint…combine it with the combination of products you like. Adding a matte poly over top will stop the chipping from continuing (if that’s the look that you’re going for). Although you do NOT want to apply an oil based top coat on white which can yellow the piece. Furniture Wax: high concentration of bees wax. Apply with a cloth on your fingertip. Don’t use too much. think of it as a lotion, not a nailpolish and work it into the grain of the wood. if you love satin latex piece, then you don’t need a wax. A matte top coat would be okay. Antiquing Wax – most waxes are meant to be used as a stain and a wax in one. Not this wax! Her waxes go on much thinner and lighter. White Wax – STENCILING WITH WHITE WAX! it lightens a color looks faded. Tip! You can mix the white and antiquing wax together, and you get a grey wax. Great for creating that Restoration Hardware look on natural wood pieces. Mix with white wax layers to get it just right. Aging occurs naturally in grooves, corners of a furniture piece. You can simulate the “antiquing” effect by applying a product to the low point of the piece, that means the grooves or recesses or the dings, wiping it away from the high points. Antiquing will mute / darken the color of the base paint. The act of removing paint from the high points of a piece. Simulating the wear that happens as people used the piece over time. The paint has worn away. People bump the corners so this is naturally a place where distressing would occur. Wax Pucks – a crayon type of product for the resist technique. Hemp Oil. Other uses –> Use before a second coat to give an ultra chippy look. (OR after you apply it as a finish instead of wax. Apply then use a wet sanding technique fine grit sandpaper for a super smooth finish. Or use it to Revive old wood. Safe to use on food prep surfaces, like butcher block). Good to use if you’re showing your work outside instead of wax, since wax can get sticky and melt. Using hemp oil deepens the color of the base paint. Vaseline – apply in various places where you want the paint to chip / resist. Applying heat or letting a piece dry in the hot sunlight will encourage chipping. I used a hairdryer on my mantel, as seen in this video. Wax brush – don’t use on a large area….use a cloth to apply. She buffs with the brush she loads a corner of the brush only. She cleans off wax and hemp oil from the brushes with Dawn Soap. To clean the paint, MMS sells a brush soap. It works well for paint but not waxes. She talked about layers. Lots and lots of layers of paint help achieve that old world finish. 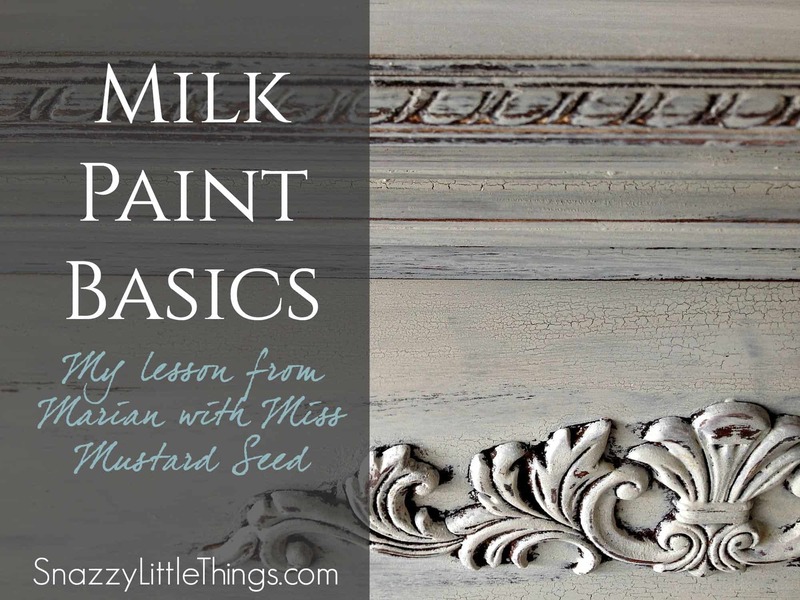 Use chalk paint as a base under the milk paint if you want a variety of colors to show through. White: White is a hard color to work with since it goes on so thin, it may require several layers of paint if using only white paint. Vary distressing by using MMS Bonding Agent in random places on a piece where you know you don’t want distressing or chipping to occur. All the best…and good luck! « DIY: Potting Bench for $75!! Just checking in with you! Love all the tips and ideas….Marion is amazing! Looks great, picked up 2 bags of MMSMP last year at the beach and can’t wait to try it. I like the idea of using the white wax as a stencil! Me too, I haven’t tried it yet but I really want to get back into using her paints. Loved the outcome, kind of like a science experiment! Thanks for the tips! I am going to try this in the fall. I am saving all your tips!!! Great I’m glad it helped. Kind of helps to get direct coaching from Miss Mustard Seed herself, so I was much more confident after her class. Good luck! Beautiful mantel! Will there be a tutorial coming? Hi Kate, thank you! Maybe someday, this is sold in our shop and we are in our busy season…so once things slow down we will. My husband winged it this first build and he said he perfected his technique since then. Thanks for stopping by to comment!